Three fire trucks, an ambulance and several police officers raced to Whangarei Airport when an aircraft carrying a pilot and eight passengers touched down with one of its twin engines out of action yesterday. 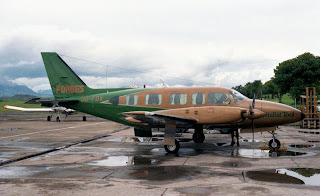 The Great Barrier Airlines 10-seater Piper Chieftain left Whangarei about 8am on a charter flight to Kaitaia with Northland District Health Board staff heading for a day's work in outpatient clinics at Kaitaia Hospital. 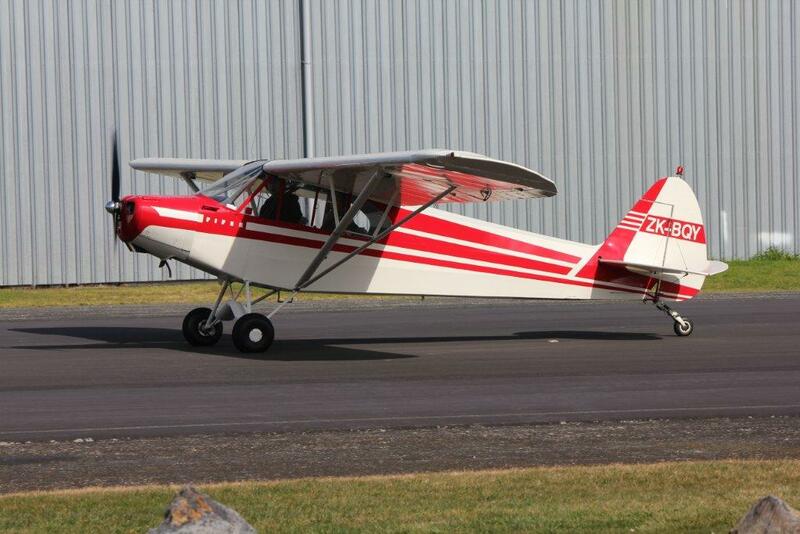 Whangarei Airport manager Mike Chubb said the pilot had missed his approach to land at Kaitaia and when he applied full power to bring the aircraft around for another approach he noticed the right engine was "playing up" so he shut it down. 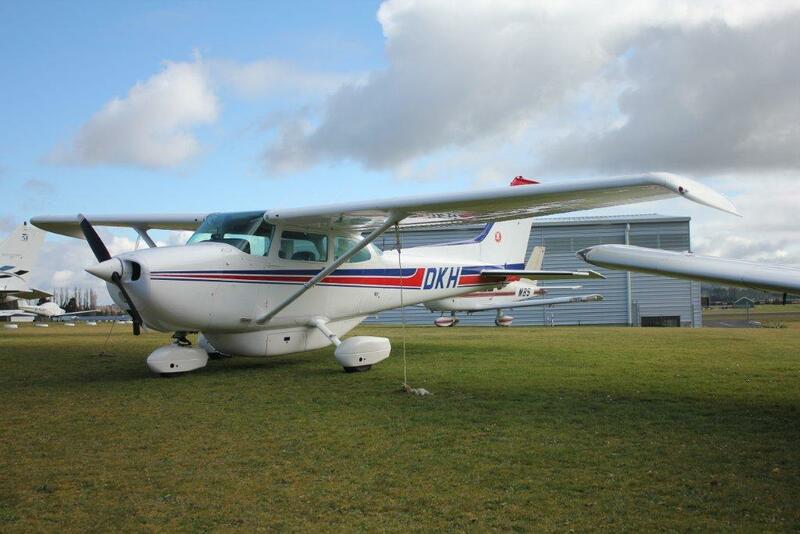 Poor weather conditions ruled out a one-engine landing at Kaitaia and because the weather at Kerikeri was also poor the pilot decided to return to Whangarei, where the plane landed about 9.45am without problems despite one of its twin engines not functioning. 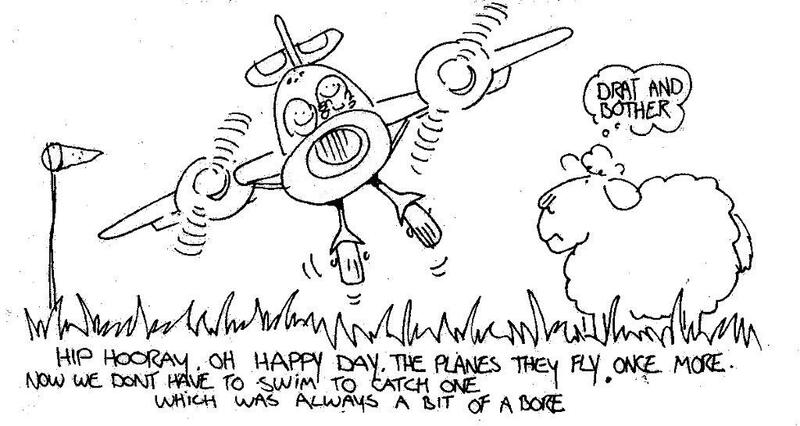 Mr Chubb said the aircraft was quite safe flying on one engine and with the propeller on the other engine feathered. 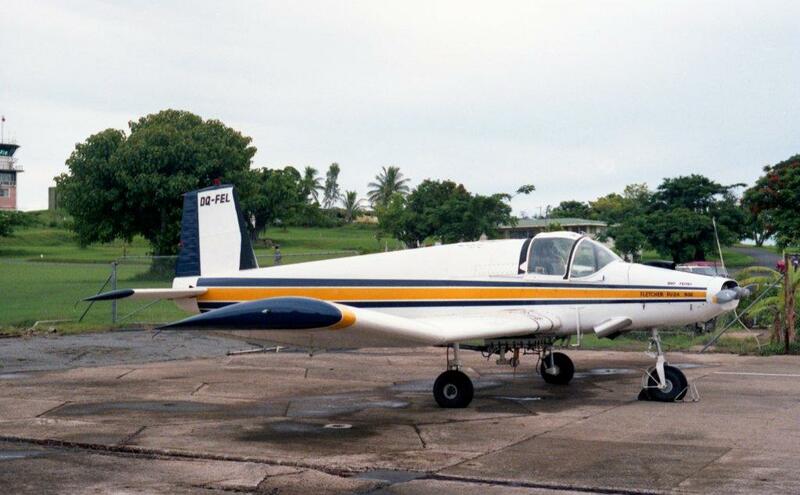 But he did not expect the Piper to fly out of Whangarei before its right engine had been checked, either by engineers based at the airport or by a maintenance crew sent north from the Great Barrier Airlines base at Dairy Flat near Auckland. 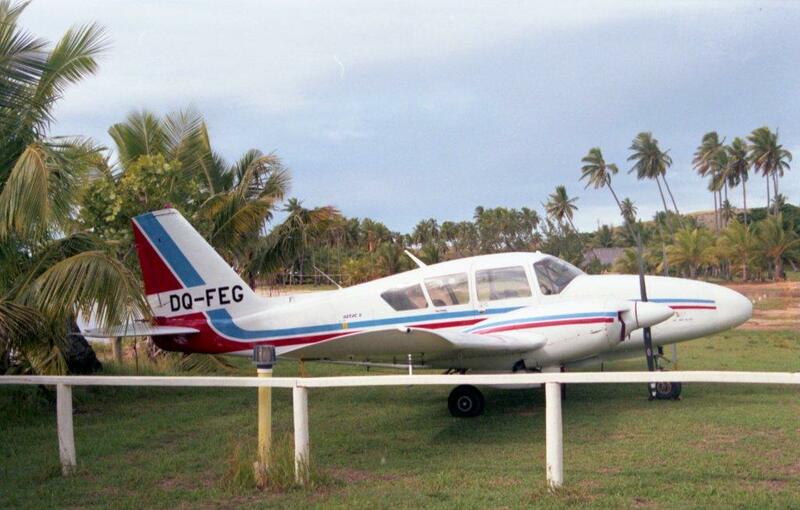 Great Barrier Airlines administration manager Anna Davidson later told the Northern Advocate the Piper had no engine problems and had been diverted because of the weather. Asked why it had been using only one engine, she said: "I wouldn't have the faintest idea." A request to speak to the airline's chief executive officer, Gerard Rea, was refused. Northland District health Board acting chief executive Dr Nick Chamberlain yesterday apologised to Kaitaia Hospital patients who were going to be seen by the Whangarei staff. 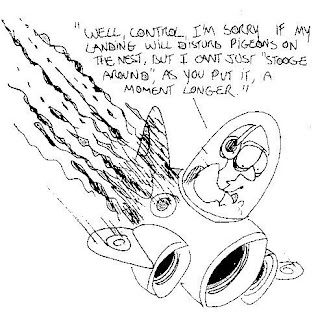 "But I am sure upon learning about the emergency landing they will understand our reasoning." New figures show the number of people choosing to fly on Jetstar’s domestic New Zealand network increased by 5% during the 2011 financial year. Jetstar Australia & New Zealand CEO David Hall said the airline carried in excess of 1.23 million passengers between its four New Zealand ports in 2010/11. “The fact we’ve been able to grow our presence in the New Zealand domestic market despite several natural disasters shows the underlying strength of our business,” said Mr Hall. 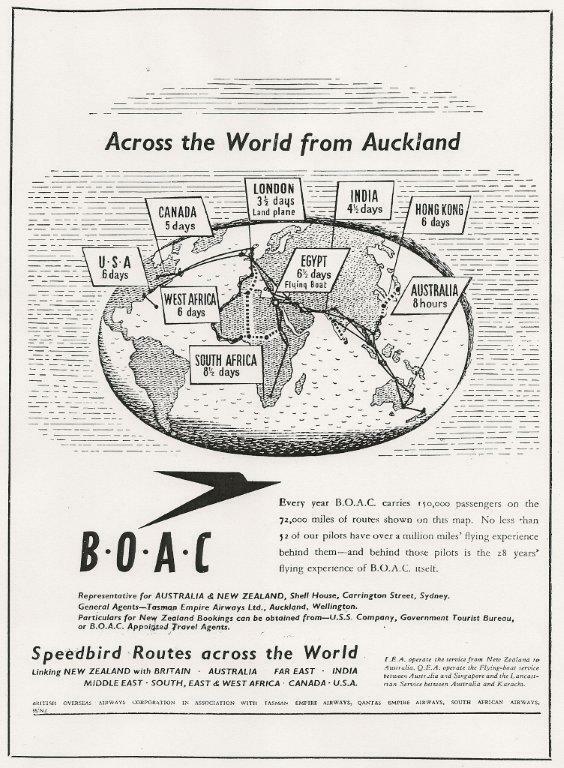 The airline’s total share of the New Zealand domestic market, bolstered by the introduction of two additional A320 aircraft during 2010/11, is now 20% just two years after start up. The Jetstar Group as a whole – including its international and Australian domestic operations – carried almost 19 million passengers in 2010/11, an increase of 14% on the previous year. Earnings before tax and interest were up 29% to a record A$169 million. Jetstar says that without the disproportionate number of natural disasters that acutely affected its operations, the Group’s earnings would have been A$85 million higher. 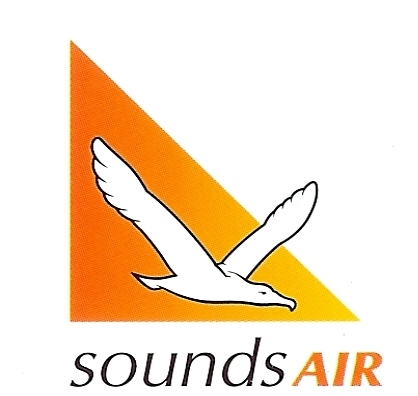 Sounds Air will fly two extra weekly flights between Wellington and Nelson from the 20th September of 2011. The two extra flights are on Tuesday and Thursday evenings, the company now offering a Sunday to Friday evening service between the capital and Nelson. 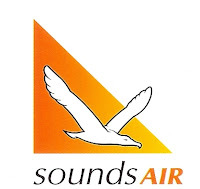 Sounds Air will, from the 20th of September, offer 22 return flights a week between Wellington and Nelson. I am in the process of scanning all my negatives into the computer﻿... 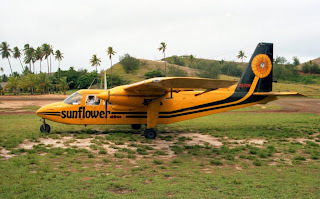 These are the photos of my first trip to Fiji in 1987. My ride across to Plantation Island's Malololailai Island airfield was Sunflower Airline's BN Islander DQ-FCA. 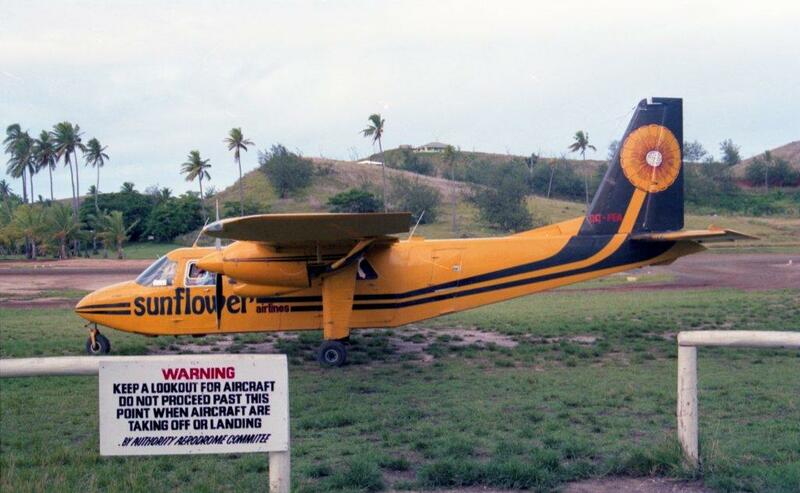 This was also my first flight in an Islander. 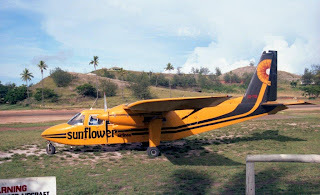 Taken at Malololailai on 13 February 1997 by S Lowe. Out at Turtle Airway's base at Nadi was Cessna 206 DQ-FCZ. Malololailai. 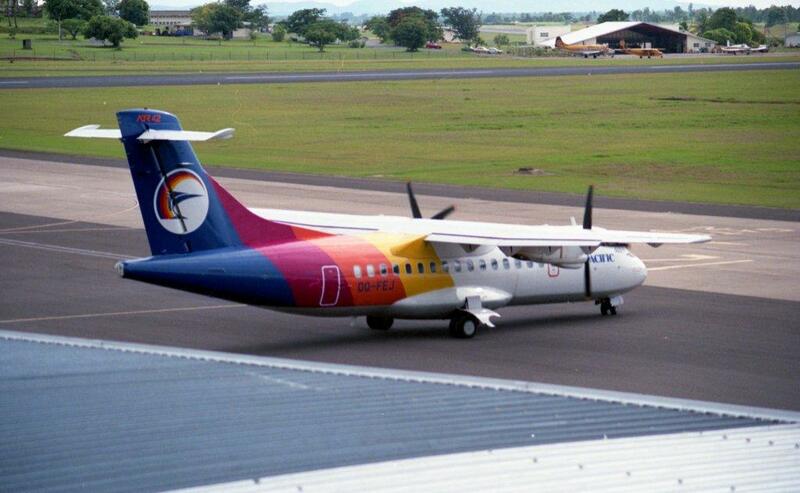 Taken at Nadi on 13 February 1997 by S Lowe. Why couldn't it park facing the terminal??? My first sighting of an ATR 42, Air Pacific's DQ-FEJ at Nadi on 13 February 1997 by S Lowe. Wayne Grant captured Jetconnect's new Boeing 737-800 ZK-ZQH in its Qantas livery arriving at Auckland on the 27th of August 2011. 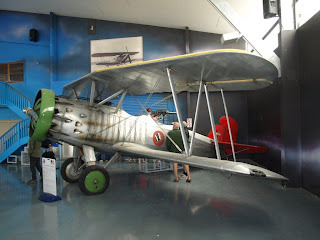 Taken at Masterton in January 2011... What aircraft type is this??? Is it NZ registered??? Taken at North Shore in November 1986 what is the registration of this Avenger??? Waiheke Island’s first air service was operated by NZ Tourist Air Travel Ltd using amphibious Grumman Widgeons. 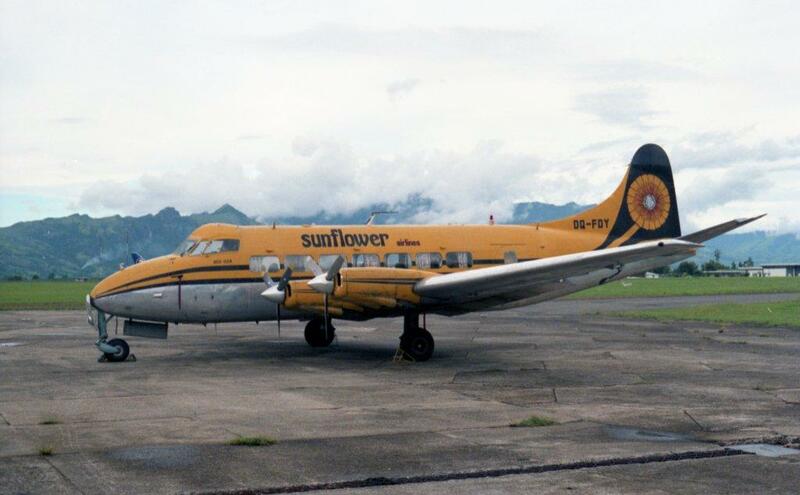 The amphibian service was subsequently operated by Mount Cook Airlines from 1968 and Sea Bee Air from 1976. 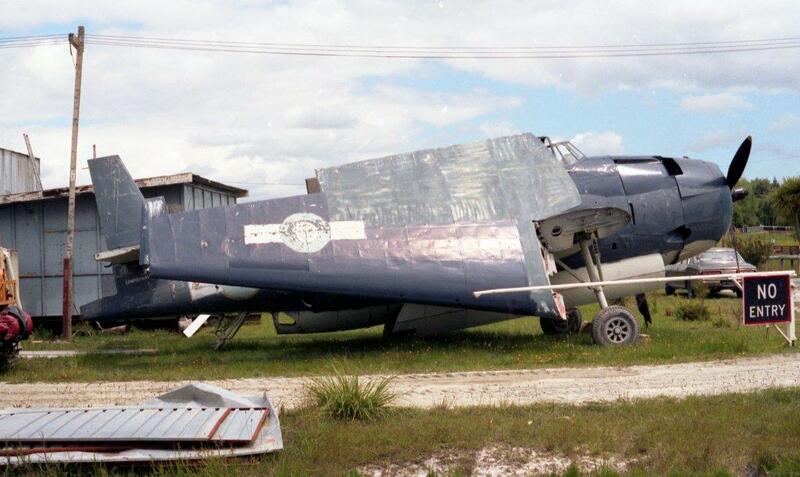 Both companies used Grumman Widgeon and Goose aircraft. 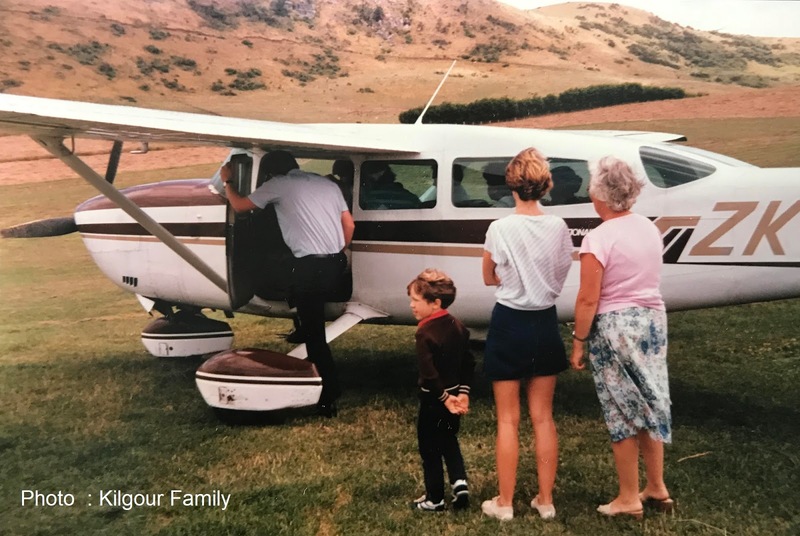 The first land-based service to Waiheke began in 1975 when Rex Air Charter began scheduled flights from Ardmore to Waiheke’s Stonyridge airfield on the Onetangi road. 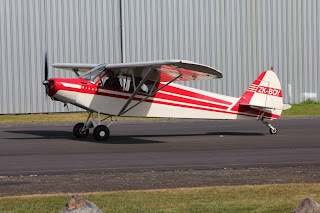 The Stonyridge airfield was a one way airstrip which had originally been used as a farm topdressing strip. The Civil Aviation Division required improvement work It be carried out on its undulating surface before it issued a permanent aerodrome licence. 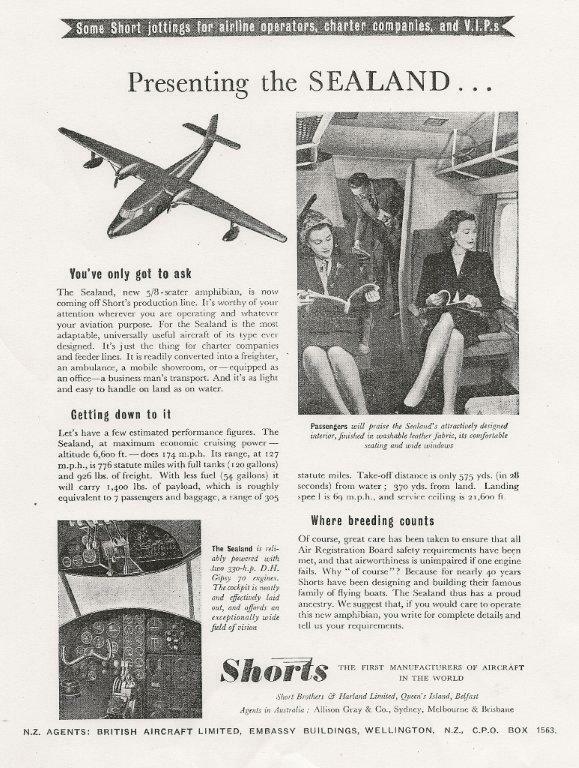 The improvements were such that a change in zoning had to be sought and this brought the airfield into the public arena. Concerns being expressed about its suitability as an airfield and complaints were also levelled about the public nuisance that flight operations caused. 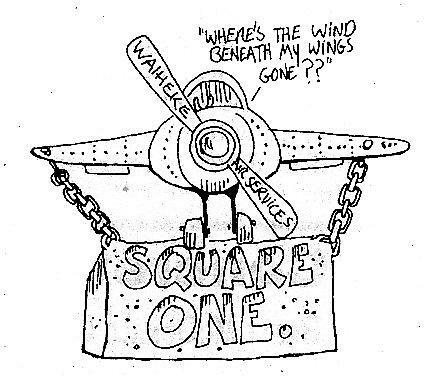 Such complaints about the effect of aircraft noise on the Waiheke’s quiet life have been a hallmark of the island’s aviation history. 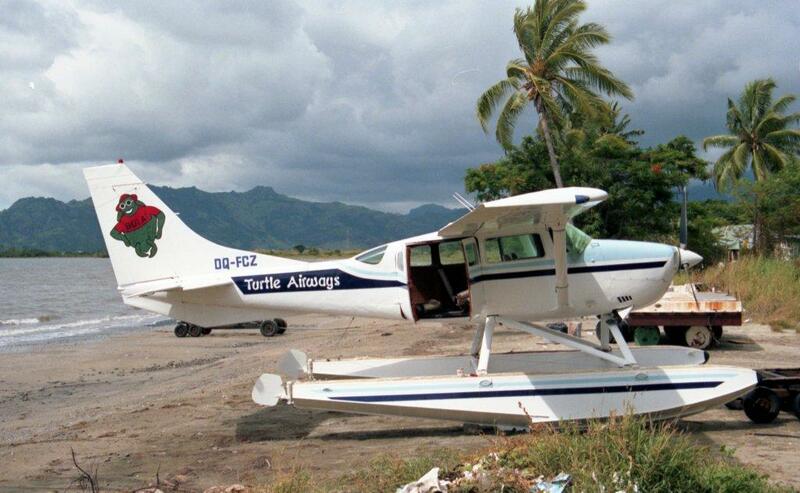 Despite the limitations of the airfield the six month suspension of amphibious services in 1976 boosted Rex Air Charter’s business and so the company negotiated a 20-year exclusive lease of the airfield from the landowner, Mr K Murphy. The increase in traffic was a mixed blessing for the company. 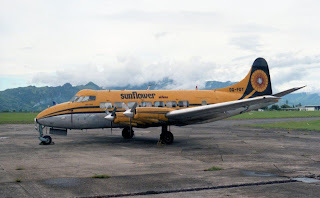 With the increase in traffic the airfield surface deteriorated in the wet winter of 1976 and the company had to restrict the number of flights. Wet weather was going to be an on-going issue for the airfield. 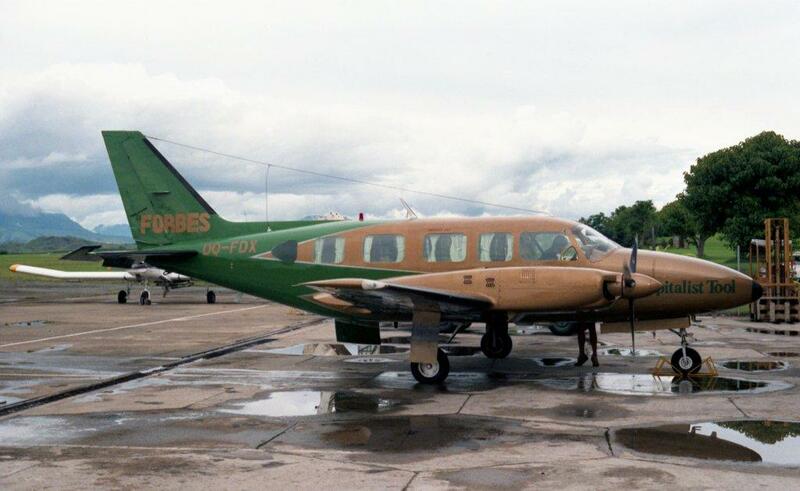 The following year, in conjunction with the St John Ambulance Association, emergency landing lights were purchased and used for night medevac flights. 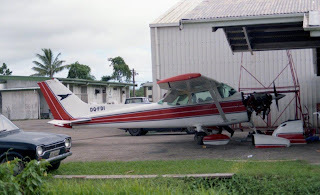 Rex Air Charter strictly enforced their exclusive rights to use Stonyridge Airfield preventing all other commercial and private operations. 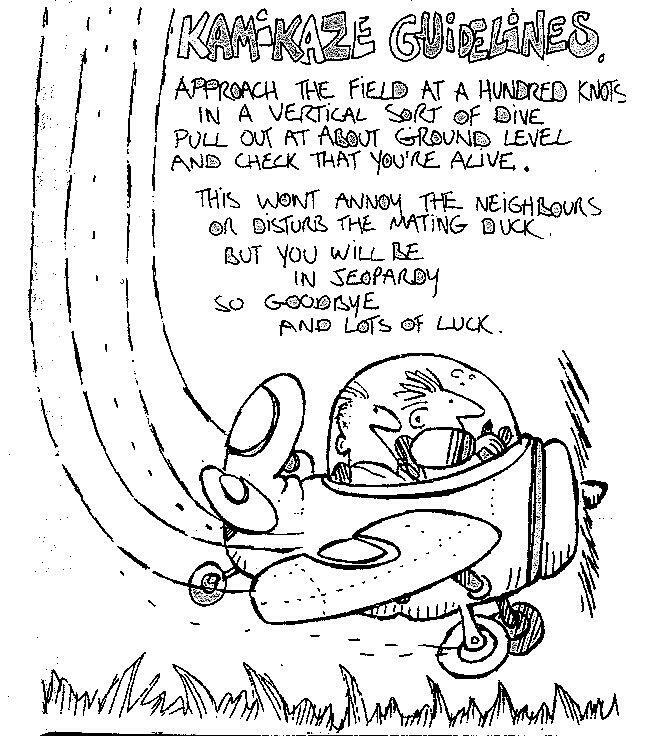 This stance was always controversial and so in 1985 Chris Reeve, a local farmer and Waiheke Island County councillor, looked to establish his own airfield. 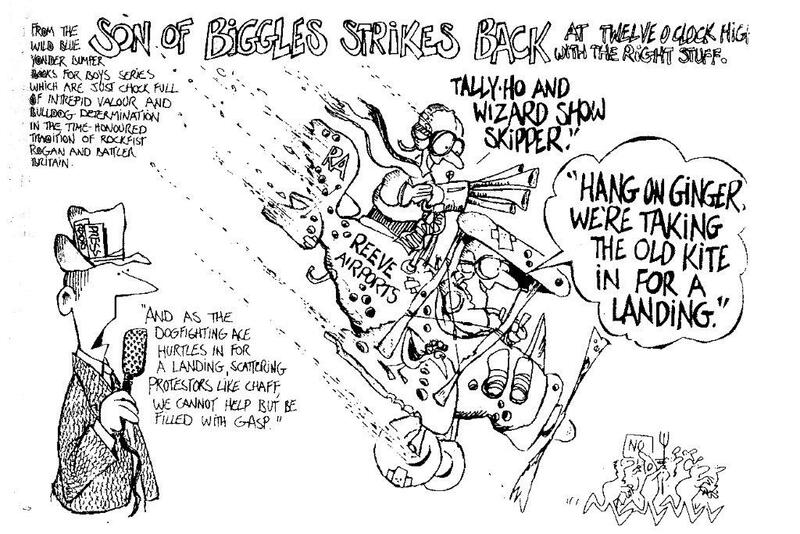 By March 1986 construction was well underway and the opening round in the dogfight between the two airfields was set to commence. 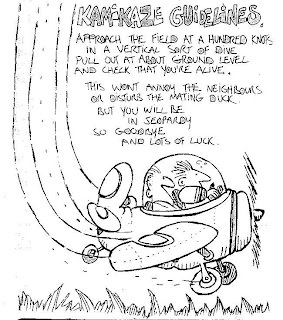 In the Gulf News of the 21st of March 1986 Chris Reeve suggested that his airfield would be the best on the island and suitable for commercial use. 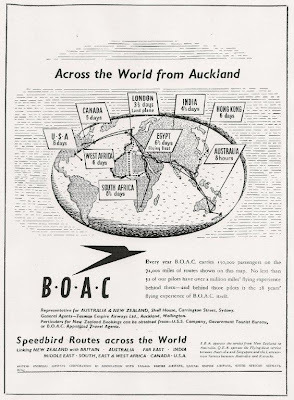 He said he “was building his strip to meet the requirements of a category ‘seven’ airfield; the existing airfield near Onetangi is variously described as a ‘nine’ or ‘ten.’” The categories, established by the Civil Aviation Division, ranged from a one, for an airport like Auckland International Airport, to a ‘ten’ for a basic airstrip in a remote area. 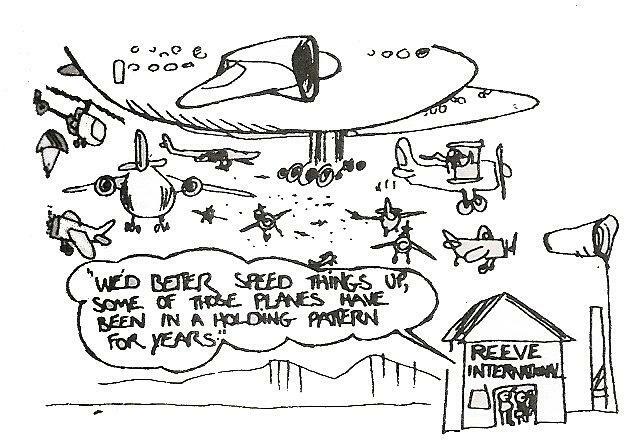 Chris Reeve sought to make his airfield suitable for commercial or general use and capable of taking all single-engine planes and a number of twin-engined craft including a Britten Norman Islander. 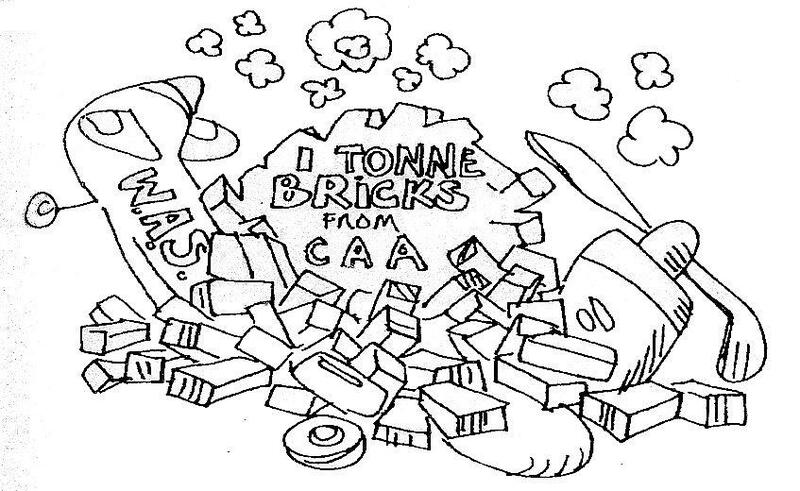 Chris Reeve and the Civil Aviation Authority were positive about the new airfield. Asked whether Rex Air Charter would use the new airfield Brian Sutherland, the airline manager, told the Gulf News he was “waiting to see what the (Reeve) strip looks like when the earthworks are finished." The Gulf News reported him, however, as being less enthusiastic about the new field than Mr Reeve or the Civil Aviation Division. 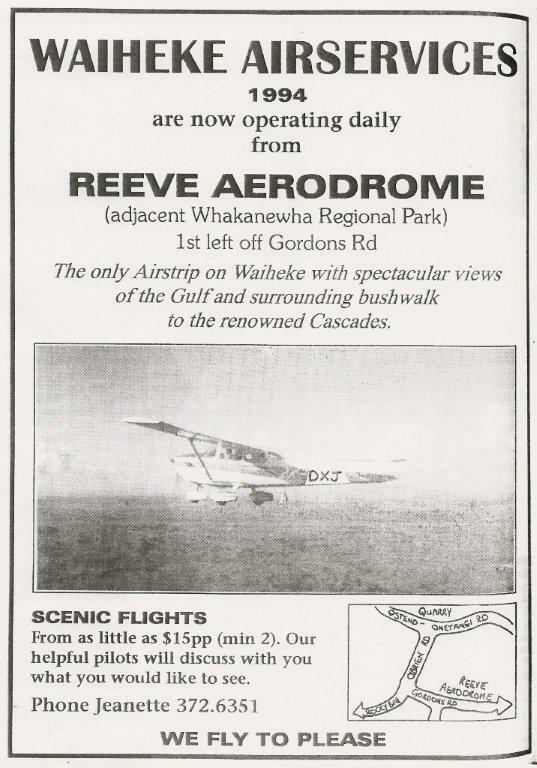 Reeve airfield was officially opened to private flights on the 29th of September 1986 but the Waiheke County Council kept Great Barrier Airlines circling waiting to land while it heard an application for planning permission to use the new airfield for commercial flights. 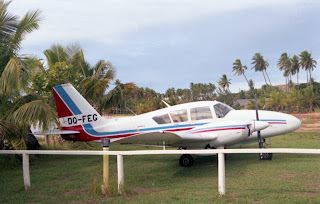 "Now that Civil Aviation have licensed a category 8 aerodrome (Reeve) on the island I expect that they will wish to see discontinued commercial air services from the other airstrip (Stonyridge).” - Chris Reeve, airport owner. "It (Stonyridge) is unsafe from a flying point of view in a number of respects ... its use is restricted to only one commercial operator, it is the most unsatisfactory airfield sustaining a scheduled air service in New Zealand." - Jim Bergman, Great Barrier Airlines managing director. 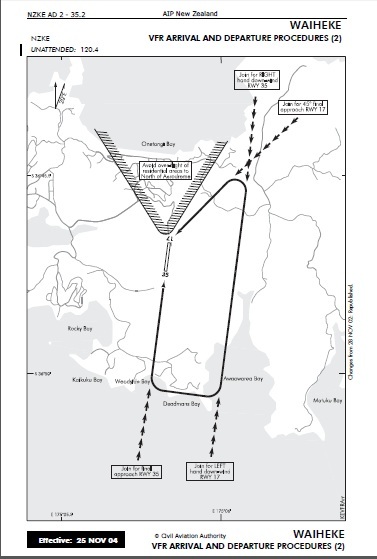 “It is understood that Civil Aviation Auckland Division have recommended to Head Office that the licence for the existing (Stonyridge) airfield be revoked." - Richard Brabant, counsel for Great Barrier Airlines. 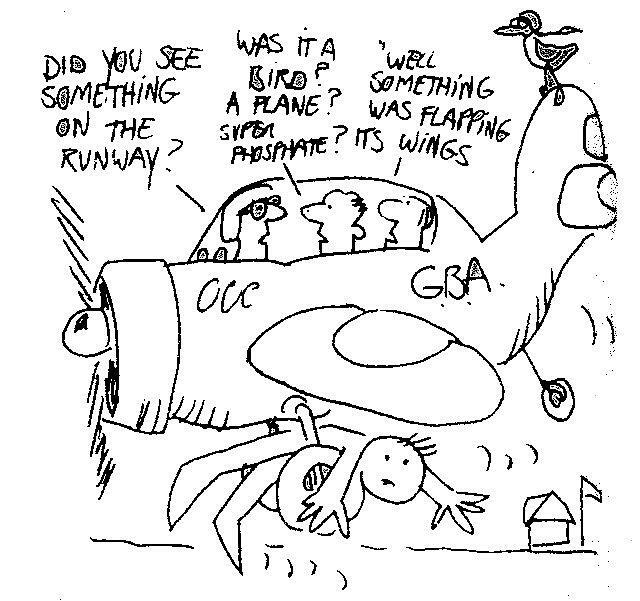 "Civil Aviation reluctantly agreed to the issue of a licence (at Stonyridge) whilst imposing severe limitations upon the use of the airstrip because of safety reasons." - Ted Watts. 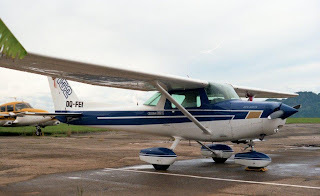 General Aviation Inspector for Civil Aviation Division, Ministry of Transport. 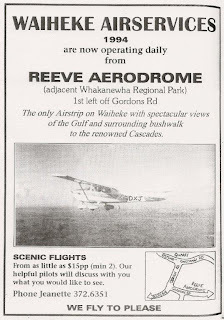 On the 25th of January 1987 Reeve Airfield was given a full operational licence by the Civil Aviation division of the Ministry of Transport but the Waiheke County Council had still not given approval for commercial use of the airfield. There was also a growing swell of opinion about the impact the airfield would have in terms of noise and also the impact of aircraft on adjacent ecological reserves. Questions were also raised about the safety of the new ridge-top airfield in regards to its susceptibility to turbulence and wind sheer. 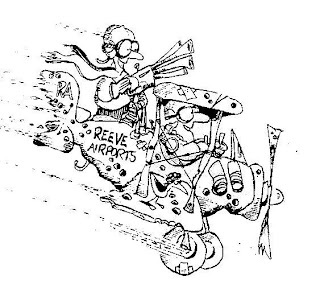 By mid-1987 no progress had been made on the matter of commercial flights using Reeve. 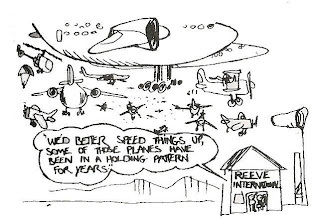 George Richardson, however, unable to fly from his own airstrip, had commenced offering flying lessons from Reeve airfield under the name of the Waiheke Aero Club. This only added fuel to the fire, the local Planning Committee saying this was a commercial activity. 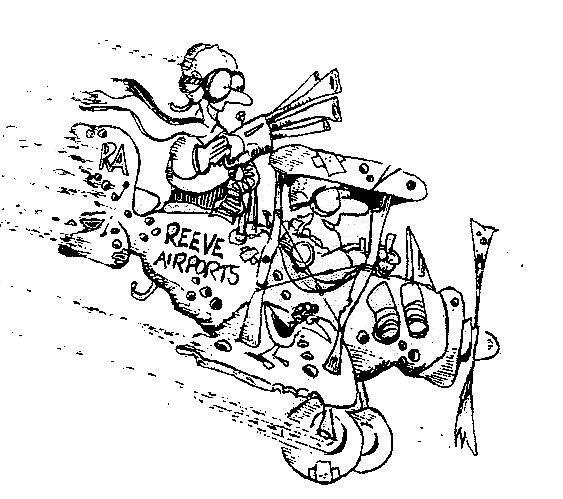 The matter finally came to the Planning Tribunal in October 1987 but it took some months before it ruled in 1988 that commercial flights could not use Reeve. 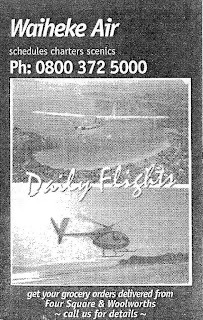 In 1992 another attempt to made to open Reeve airfield to commercial use. 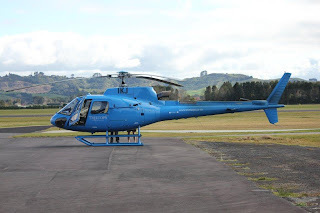 Waiheke Island Airfields Ltd applied for a resource consent to develop the airfield in order to open it up to general use by both commercial operators and private pilots. 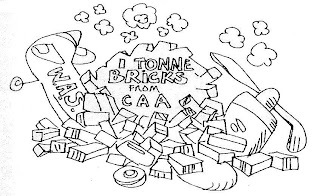 The new application was heard under the Resource Management Act as opposed to the earlier application which had been heard under the Town and Country Planning Act it. The Planning Tribunal included the Waiheke Planning Committee and members of the Auckland City Regulatory Committee. The new application stipulated that aircraft would be required to land from and take off to the south except when conditions made that unsafe. This mean aircraft avoided flying over nearby residential properties. 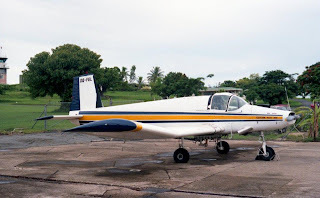 The application envisaged commercial traffic to average two Cessnas per day and the "occasional” helicopter in winter and up to five Cessnas, three Britten Norman Islanders and one or two helicopters per day in summer. The application also sought approval for earthworks necessary in the construction of a new access road. There were 36 objections to the application, most relating to noise and safety, and these dominated the hearing which began at the end of July. The Gulf News report captured the fiery nature of the hearing. “In the best tradition of Waiheke politics - or the worst, depending on your perspective - the gloves were off and accusations flew thick and fast. 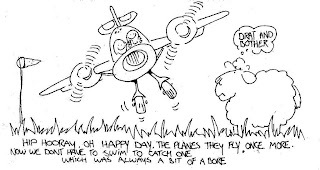 The planners who recommended the application by Waiheke Island Airfields Ltd be approved were labelled incompetent and biased by some objectors; local community board member Joe Waite, also accused of bias, was forced to stand down from the hearing; and the applicants were called unreliable.” The lawyer for the airfield company, Paul Cavanagh QC, said, “The hearing had brought the division in the community into sharp focus. The majority of Waiheke Islanders accepted some change, he said, while a vociferous minority were opposed to anything. Because of the conditions involved including the flight paths, the fears of Onetangi residents that their skies were about to be noisily invaded were groundless and will rapidly evaporate.” Once again, however, the application was declined, the Planning Committee saying “the applicant, Waiheke Island Airfields Ltd, failed to demonstrate there was a need for an airfield as required by the Operative District Plan and that commercial use of the airfield would have also detracted from the ‘maintenance and enhancement of the amenity values and the quality of the environment in the area.’” In response the airfield company announced it would appeal the decision. 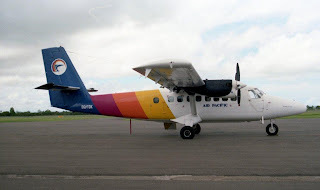 In mid-1992 ownership of Waiheke Air Services (which had operated as Rex Air Charter until 1986) passed from Motor Holdings to Flightline Aviation Ltd. The new owners were more open to the possibility of other users having access to Stonyridge airfield and in October 1992 Flightline Aviation relinquished its exclusive licence to use the airstrip. At the same time they announced their service would only operate on demand from November and their air service subsequently ended. 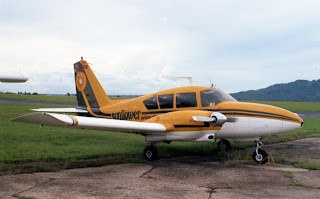 George Richardson, the owner of the airstrip, was quick to use the airfield and he formed Gulf Island Air to offer scenic flights with his Piper Pa28-180 Cherokee ZK-SNE. 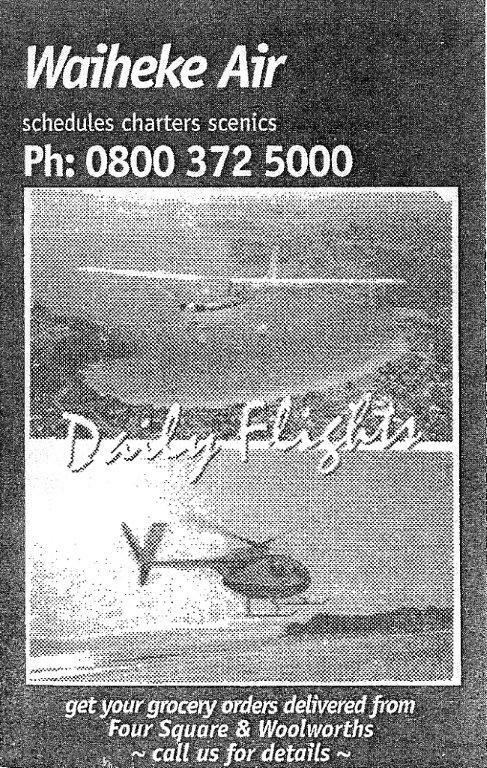 With the availability of Stonyridge Great Barrier Airlines immediately started advertising that it would operate to Waiheke and began flying there in November 1992. The airline quickly found the short strip with its steep slope at one end difficult. 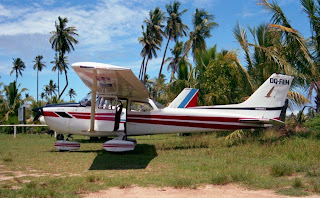 The company was unable to use its Britten-Norman Islanders into the strip because of its Category 9 status. By February 1993 Great Barrier Airlines had pulled out of Waiheke and had established a relationship with Gulf Island Air to operate transfer flights to and from Auckland and Great Barrier Island on their behalf. 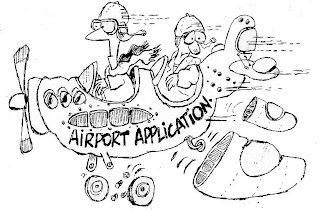 In February 1993 the airfield company returned to the Planning Tribunal to have its appeal heard. It was not until August, however, that the Planning Tribunal decision started to clear the way for Reeve Airfield to be used as a commercial airfield provided there were satisfactory controls on noise and earthworks. The judge said approval would not be given for take-offs to the north unless the parties could find a way around a Civil Aviation Regulation forbidding turns below a height of 500ft. Waiheke Airfields Ltd and the Auckland City Council were given six weeks to reach agreement on an appropriate set of conditions. 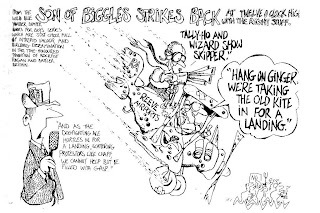 On the 15th of October 1993 the Gulf News reported that “Rivalry between Stonyridge Aerodrome and the so-called Reeve Airstrip - hitherto confined to sniping in the planning arena - burst into open dog fighting two months ago. Stonyridge strip owner George Richardson, operator of Gulf Island Air, lodged a formal complaint that an aircraft based at the Reeve strip had made an illegal commercial flight to Great Barrier. 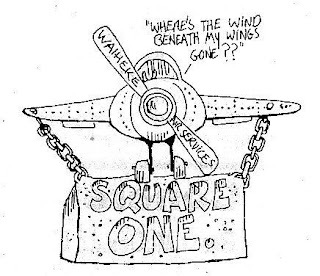 In return, Dennis Musson, a member of the syndicate which owns the Whakanewha block, on which the Reeve strip is situated, and owner of the aircraft in question, filed a complaint that the Stonyridge strip was not up to the standard needed for commercial flights.” This was the forerunner of Waiheke having two commercial operators, Gulf Island Air and Waiheke Airservices, both of which will feature in future posts. 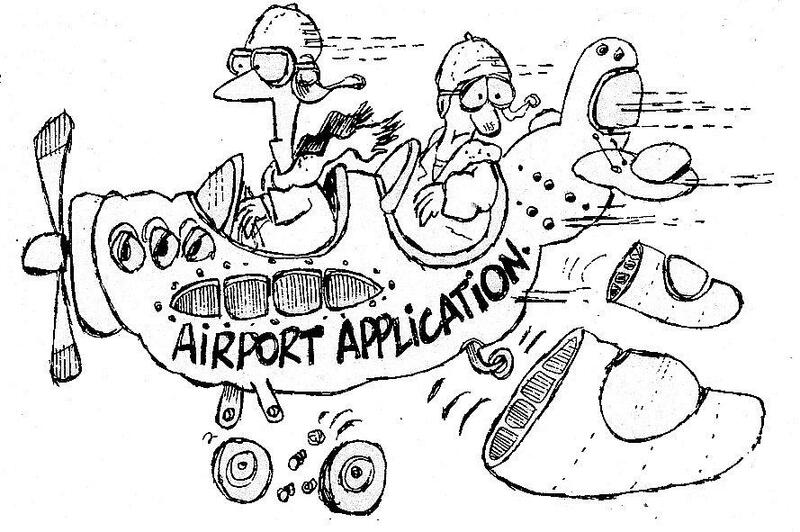 Final approval for commercial use of the Reeve Airfield finally came in early 1994. 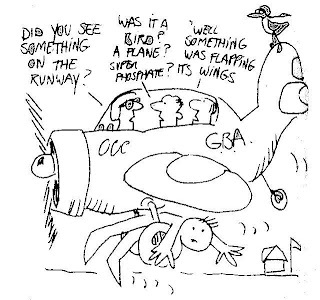 In granting the approval Judge S E Kenderdine included 27 conditions agreed to by the parties including aircraft having to land from and take-off to the south except when conditions make this unsafe. 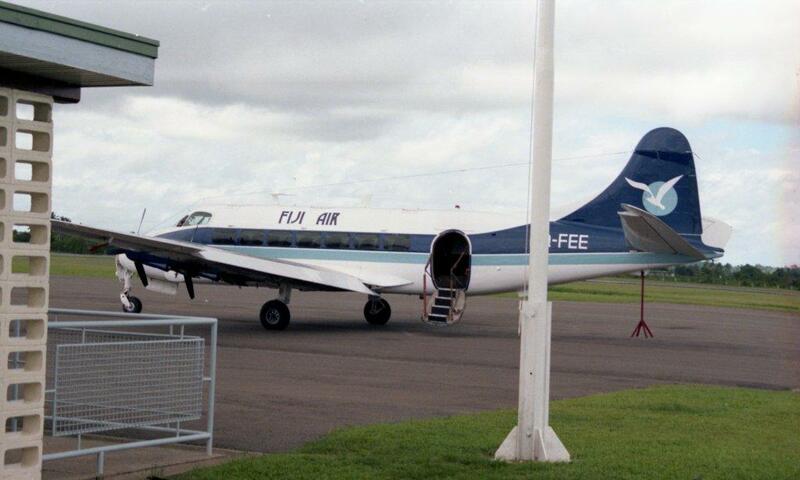 With all the conditions finally met the airfield received its first Great Barrier Airlines’ flight on the 26th of August 1994. The commencement of the service was not without incident. 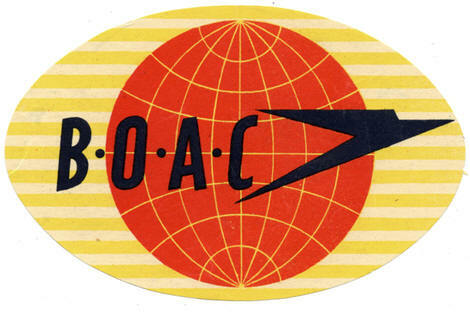 Within days there was a confrontation between a Great Barrier Airlines’ pilot, his passengers and a local resident. The local, who happened to be the local residents' representative on the airfield's safety and management committee, walked out onto runway as the pilot had lined up the Britten Norman Islander for take-off. The protester told the Gulf News that after a plane had flown low over his house for the second time in two days while making a landing approach from the north, in contravention of conditions pertaining to the planning consent, he went and spoke to the pilot. "I felt the pilot had not been briefed on the restriction of movements at the northern end of the strip and that it was time someone told him." Ironically the Great Barrier Airlines’ service only lasted until April 1997, leaving Waiheke Airservices and its successor, Waiheke Air, being the only regular commercial users of Reeve Airfield. By then, however, the airfield company was embroiled in another dispute with conservationists over more earthworks and the removal of trees. Reeve Airfield, the ultimate victor in the battle of the two airfields, still has restrictions on landings. There is now no longer any scheduled service to Waiheke though Air Discovery has their Cessna 206 ZK-WWH based at Reeve and it offers transfer flights to Auckland, Great Barrier Island and the other airfields of the Gulf on demand. 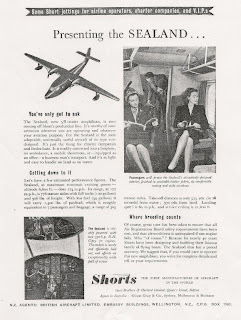 By flying boat or Lancastrian - which would you choose?